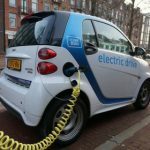 Do electric vehicles reduce CO2 emissions ? A sustained development of electric vehicles is considered by French authorities. The Energy transition bill passed in 2015 plans the installation of seven million charging stations by 2030. At the 2016 Paris Motor Show, French Environment Minister Ségolène Royal announced a goal of one million stations within three years supported by new financial measures. The focus on this type of vehicles is justified by the fight against climate change, as it is considered as a low-carbon means of transport. But is it true ? How much greenhouse gas emissions are electric vehicles really generating ? Is it worth planning such a massive deployment ? To estimate the CO2 emissions driven by a surge in electric vehicle use, it is necessary to take the full life-cycle into account including the production, use, and end-of-life of vehicles. In the use stage, CO2 emissions vary according to the way the electricity to charge batteries is produced, the intrinsic energy efficiency of the vehicles and the performance of the charging technology. In France, a fleet of several hundred thousand or a million electric vehicles could well be powered by existing power plants. However, a larger deployment of several million units would require new electricity production means. Considering the weak clean energy policies in place, the current rate of renewable energy development would not be sufficient to meet this surge in demand. Additional fossil fuels would be necessary. Therefore, there is no guarantee that a quick and large development of electric vehicles would significantly reduce CO2 emissions in the country. The only way would be to implement ambitious electricity saving and clean energy policies in parallel to this electric vehicle deployment. Yet, the issue of the production and end-of-life of batteries will remain, as these also have an impact on the environment and greenhouse gas emissions. (Français) Fermer 17 réacteurs nucléaires : une absurdité ?